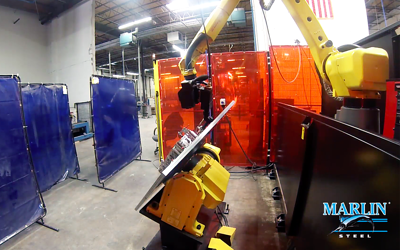 Check out the GoPro video below of the USA made Robotic Tig Welding Cell at Marlin Steel. This positioner can hold 1,100-pound parts and moves in harmony with the welding robot arm. Tungsten inert gas welding is a process that uses an electrical current to superheat metal alloys to partially melt them. The more resistant the metal is to the current, the faster it will reach its melting point so the weld can be completed. Unlike gas metal arc welding, the electrode used in TIG welding can be a non-consumable type. Superior weld performance when joining smaller pieces of metal makes it easier to meet tight production tolerances. Normally, GTAW welding is a bit more difficult to precisely control than GMAW welding. 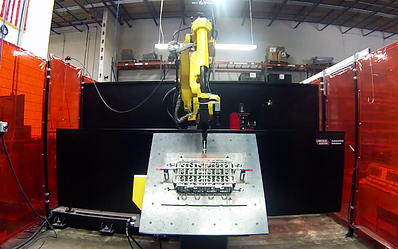 However, Marlin’s use of CNC robots allows Marlin’s production team to consistently perform delicate welds that require millisecond-precise timing. Marlin’s robotic GMAW welding systems use a consumable metal wire electrode that acts as a filler material to help bond two pieces of metal. Because the electrode becomes a filler material, this welding process doesn’t have to melt the metals being joined to achieve a weld. While weld splatter is always a concern when dealing with welds that use filler materials, Marlin Steel’s MIG robotic welding unit minimizes splatter through precise computer-controlled weld operations and secondary processing techniques to remove excess spatter. 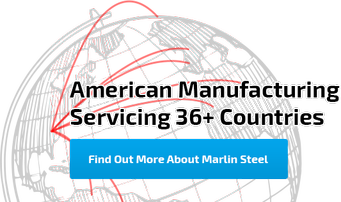 Marlin Steel is dedicated to providing “Quality, Engineered Quick®” to all of its clients around the globe. A part of delivering a top-quality custom metal form is using the right welding process for a given situation. 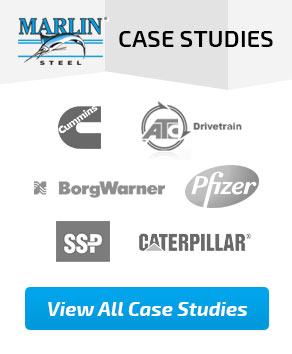 To this end, Marlin Steel maintains a variety of robotic metal inert gas (MIG, also known as gas metal arc welding, or GMAW), and tungsten inert gas (TIG, aka gas tungsten arc welding, or GTAW) welding machines on the factory floor. 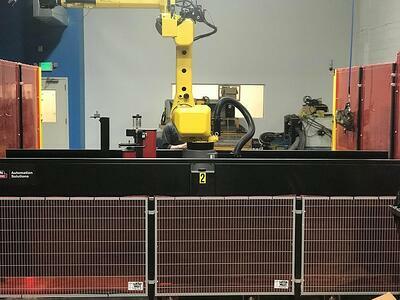 Learn More About How Marlin’s Robotic Welding Cells Can Help You!